to obtain our FREE, No Obligation quotation. Create a stunning executive environment with Concerto. Featuring rich, cherry veneered tops and panel end leg styling, Concerto delivers a high impact, streamlined look. All available are glass-fronted storage units and conference options. 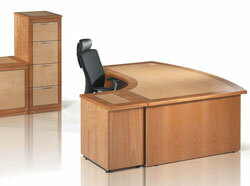 Executive range with 25mm desk veneers and storage. Desktops feature profiled edges, finished in matching cherry. Curved back panels. Stylish design details are a feature of this executive range. All components have been manufactured to the highest standards. Discover executive seating to complement the Concerto range in our Seating section. With Ambus, you have the choice of either veneer of MFC finishes on all executive furniture, as well as either panel ends or metal frames for the desks. This means you can match your executive workstations to general office furniture, or differentiate them, whichever you prefer. Ambus also makes it simple to create U-shaped desk configurations, linking work surfaces to storage units. 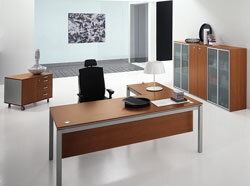 The Corniche range represents the highest possible levels of quality to meet with the demands of an executive office. Craftmanship and a close attention to detail is typical of Corniche, best exemplified by the solid sculptured wooden pen tray, available in all Corniche pedestals. Minster offers a superior range of coordinated desks, meeting/conference tables and storage units, featuring distinctive cross-banding options and exotic wood veneers. The ideal choice for both management and executive offices..